Updating is easy if you use the Envato Market Plugin. For versions of Omega < 1.8, this is the way we recommend you update your theme. Step 1 - Install the Envato Market plugin - go to the official page of the plugin and download it. Install and Activate the Envato Market Plugin that you just downloaded. Step 2 - Click on the Envato Market menu on the admin sidebar. Step 3 - Enter your Envato API Personal Token. If you don't have an API token you can create one here. Step 4 - Paste your token in the Token field of the Envato Market menu. Click on Save Changes. 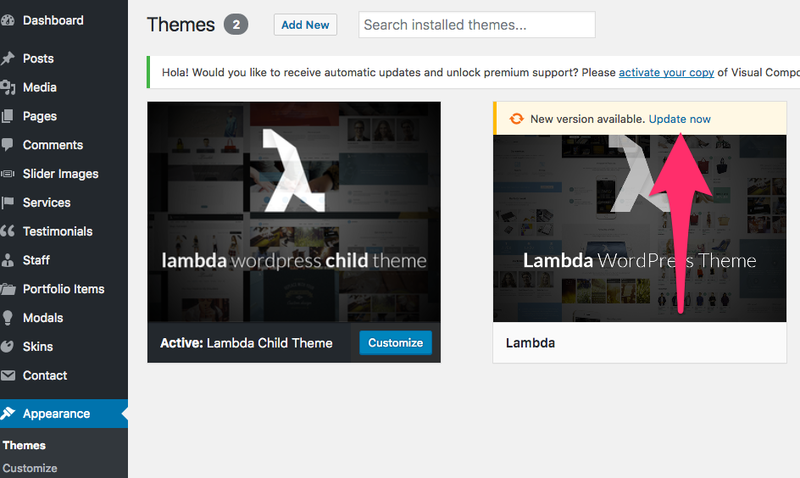 Step 5 - To check for available updates, go to Appearance->Themes and hover over the main Omega theme. If an update is available, click on the Update Now link. Step 1 - Download the theme from Themeforest Marketplace. 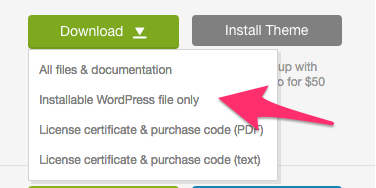 From the Downloads section click on the Download button and pick the Installable Wordpress file only download. We will use that file later to update. Step 2 - Switch to another theme. Go to Appearance->Themes and select activate on another theme. Step 3 - To delete the current Omega version, hover over the Omega screenshot and click the Theme Details button. Click the Delete button in the bottom right hand corner of the popup. Now your current Omega theme is deleted. Don't worry, you will not lose any of your work. Step 4 - To upload the updated theme version, from Appearance->Themes click on the Add New button on top of that page. Step 5 - Click on the Choose File button and pick the .zip file that you downloaded from Step 1. Step 6 - Once the upload is complete, activate the theme from Appearance->Themes and you are done! Step 1 - Go to Omega->Plugins. Step 3 - From the list of plugins hover on the desired plugin and hit the Update link, if an update is available.